Today saw us arrive at Home Valley Station. Situated approximately 120km south west of Kununarra along the Gibb River Road. It is full of wonder and beauty. We are in the riverside campground which means we over look the Pentecost River and Cockburn Ranges. Though before I tell you much about here it seems only right to fill you in on a where we were yesterday. Yesterday (and a few days before hand) we were at the beautiful El Questro Station. Which is roughly about 30 kilometres from where we are now. I say roughly because essentially we are in the middle of no where and without any kind of internet or mobile coverage so I am just relying on my memory for most facts. Being disconnected from the world at large is all kinds of awesome. Sure I miss having instant access to the wonders of Google but that is about it. The difference that it has made to Livvie is well worth it. I nearly fell off my chair the other day when she remarked how great it was to not have mobile coverage. Her reason being that without it there is so much less to worry about because you don’t need to keep checking your phone all the time to see what is happening. Mind you when I asked her if that meant she no longer needed/wanted a phone her reply was a resounding no. El Questro Station is a massive area of land that was once a pastoral lease. While there are still some 4000 head of cattle roaming the grounds it is primarily a tourist destination these days. At the information night on Monday I discovered that the company which owns the property is American. Had I have known this prior to arrival we quite possibly would not have arrived. Nothing irks me more than iconic Australian things being owned by the yanks. Having said that though I am glad that we spent some time here. The country side is truly amazing. Even though we stayed for four nights there was a great deal that we didn’t get to see. Mind you the places we did go to were nothing short of breath taking. The first afternoon saw us off on a sunset 4WD adventure to Saddleback Ridge. Teapot gave an insight to her adventurous side with her disappointment in not being able to go faster down the rather steep and rocky inclines. The next morning we were up bright and early to venture off to Zebedee Springs. A thermal watering hole that was only open from 7am-12pm. In a bid to protect the delicate environment the powers that be have decide to restrict it’s opening hours to the public. As much as I am anti early morning this was well and truly worth the effort. On the way home from the springs we discovered another 4WD track. This one lead to a place called Pigeon Hole Lookout. The view was beyond amazing. I am sure that the photos do not even come close to doing the reality justice. This would have to have been some of the most intense 4WDriving that I have done. Thankfullly Patty handled it like a dream. Once we had gotten over some of the more hairy aspects of the road Mr Awesome asked if I was interested in having a drive, which delighted the girls no end. Just between you and me it made me pretty excited as well. 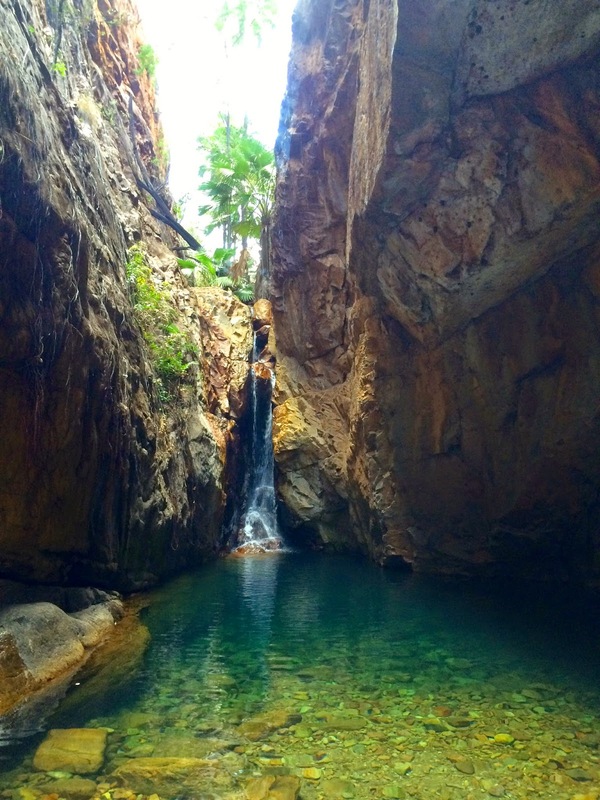 The next day was our gorge adventuring day where we decided to tackle El Questro Gorge. The signs had said that the first half was relatively easy and only about ab hour long. The second half was much more strenuous and at least another hour. We only ever intended to do the first bit but you know what happens o the best of intentions don’t you? After about fifteen minutes of walking we passed a more mature couple on their way back to the car park. They informed us of how lovely it was but there was no way Teapot would have been able to make it past the first part. Despite not having a single mouthful of food on us Mr Awesome heard that as a challenge to see just how far she could go.Which turned out to be about twenty minutes of before the end. Oh me oh my were there some big old rocks for us to get through though. Thankfully we had our camel packs with us and had plenty of water to keep us keeping on. At the time I was a little disappointed with the end waterfall. The two big girls and I left Mr A and Teapot at a rather beautiful little place while we attempted to make it to the end of the walk. The last 30 metres were incredibly challenging. Especially since I missed the route markers showing the easy way. With hindsight and without exhaustion though I am able to say that I am glad we made it to the end.